Happy Tuesday guys! I have been wanting to share this casual fall look with you for a while. I bought the jacket and lace top during the Nordstrom Anniversary Sale and have been wearing them together on repeat ever since! I love the combination of leather and lace; and the details on this jacket and this top just make the outfit one I can’t stop wearing! My favorite part about the jacket, and what sold me on it during my hunt for a faux leather jacket, is the gold detailing. The exposed zippers on the sleeves and the gold buttons just pop. I was also really impressed with the quality of this jacket – the stitching is really well done and the material feels great. 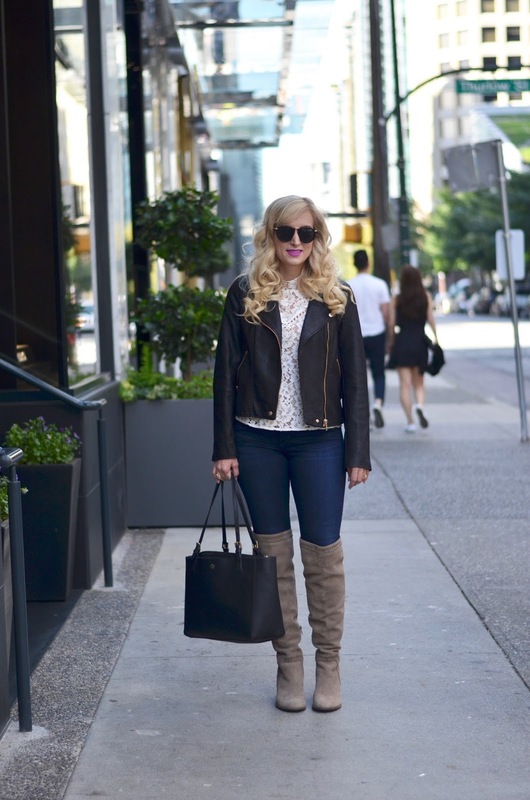 For a casual fall look I paired the jacket and top with some comfortable jeans and over the knee boots. I mentioned these OTK boots in my roundup of must-have fall boots and I swear by them! They are comfortable and i love the looser OTK fit. Last thing I have to talk to you guys about is this ah-mazing lipstick. You’ve probably seen in on my instastories about a million times over the past few weeks. I borrowed this shade from a friend during NYFW and ran to sephora to buy myself one as soon as I got back to Canada. The shade is so pretty and it lasts really well throughout the day. I cannot recommend it enough! I hope you’re work week is off to a great start! Be sure to come back tomorrow for another blog post! "Bell Sleeves & a Fall Sweater"
"8 Must Have Ankle Boots for Fall"
I love the leather and lace together. Great combo of feminine and edgy! I love leather and lace! Great look! Oh thats awesome I love a good sale! Great sale!! Loving all the boots!! The beautiful contrast between delicate lace, tough leather and sturdy denim never goes out of style. 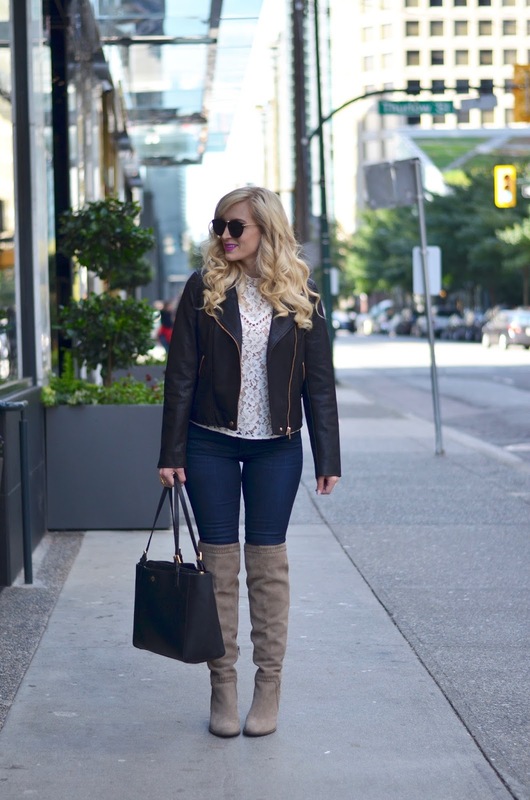 I adore the black jacket paired with feminine lace top and I'm loving those boots! Great post!!!!!! Thank you for sharing.